Preparation of cheap high-calorific forages for animals and birds is an actual problem in agricultural production. One of problem decision methods is use of technological line of forages production which includes modular compact units for deep processing of a wide set of initial products: fibrous vegetative raw materials, root crops, straw, peat, a waste of integrated poultry farms, pig farms and fish factories. Technological line TLPF is universal remedy for the balanced forages production of a various compounding. 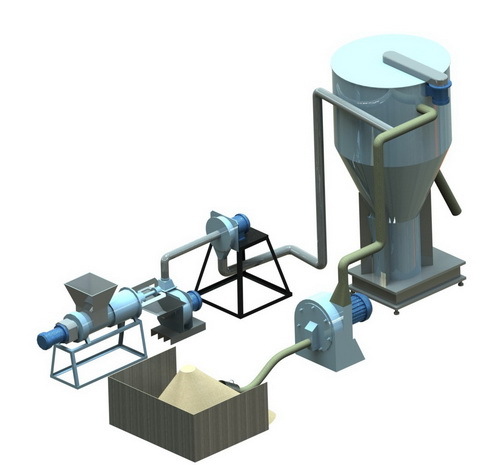 In structure TLPF can be included, depending on properties of initial raw materials and requirements to a final ready product: milling, shredder or knife crushers, a rotary-seave mill, granulator. Crushing of components to fraction 5 – 10 micron and their extruding in case of need it is necessary to include a cavitator-grinder KIP in a complex.